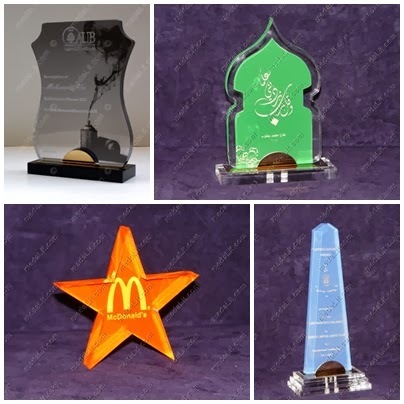 You can order your acrylic trophy to be colored according to your likes. Color can be applied to specified regions, engraved artwork can be color-filled as well. Coloring your trophy requires an additional charge. Acrylic plates thickness is 18, 15 or 10mm for sizes A, B or C respectively. Appearance: Crystal-clear body on top of either piano-black or clear base and base top with clip. Other colors are available as well as custom-coloring. Metallic base top and clip are available in mirror gold (GB), matt gold (GM), mirror silver (SB) or matt silver (SM). No glue is applied to hold the body and the base together. Any text and drawing can be laser engraved on the body. Engraved areas appear milky white on clear surfaces, alternatively they can be color-filled. Every ordered trophy can carry a unique message. Packed in a carton gift box as a standard. Medals produced to fit can be added if requested by customer and require additional charge according to medal size (only in case the selected trophy does not include medal(s) as part of it is original design). Available in 3 sizes A, B and C .